Inspired by the success of the women’s collection Slimline, Swiss brand decided to improve the same collection for men. 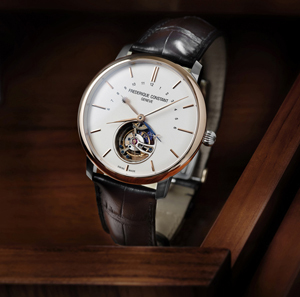 As you know, the crown of excellence in mechanical watches – is tourbillon. Thus, in this model range, two options. Housing some hours entirely of polished steel (starting price € 26,500). And the other watches bezel is covered with 18-carat rose gold (starting price € 28,500). In both cases, the back of the watch is a sapphire crystal, through which one can see the unique manufactory movement with anchor wheel and balance wheel in silicon. Its frequency – 28,800 vibrations per hour, power reserve – two days. Automatic winding rotor is also covered with rose gold. The watch comes on alligator strap with folding buckle. All 180 copies, packed in a wooden gift box, will soon be available to the general public.